She Wore Red Trainers by Na'ima B. Robert is not like any other book I've read before and I really like it for that very reason. It's always a good thing, I think, reading books very different to our own personal beliefs. It's good to read a story with a very different perspective and to see things differently. And that's what my enjoyment of She Wore Red Trainers was about for the most part. 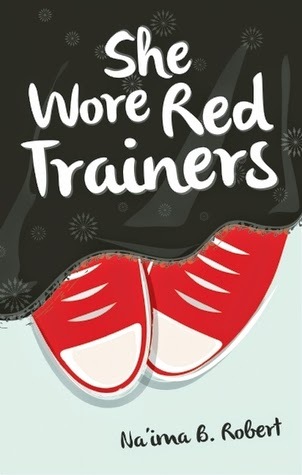 She Wore Red Trainers has the subtitle 'A Muslim Love Story' and it is a dual-perspective novel telling the story of two teenagers, Amirah and Ali, and how they came to meet each other and fall in love and how their relationship conforms to the ideals and customs of the Muslim religion. It was a very different experience witnessing Ali and Amirah's feelings for the other develop over the course of this novel. A lot of that connection was subtle: there wasn't very much direct interaction with each other and I felt like the two characters found out about each other more from other people, through friends and family etc, than they did through actual conversations and spending time with each other. And while as a reader seeing the events unfold from both perspectives and seeing how both Ali and Amirah feels about the other, I think it's more apparent that these two characters potentially have a lot in common and that there might be the possibility of more, I still wanted to see them talk a bit more and to see some of their shared ideas and hopes and dreams verbalised. I really enjoyed getting to know both Ali and Amirah throughout this book. I felt like the romantic elements of this story are kind of on a back burner and at the forefront of this novel is the character development of both of our main characters as they struggle in their friendships and families and their futures. And I really enjoyed seeing how their religion shapes a lot of their thoughts and decisions and how it both helps and guides them through. We have Ali, who has moved to London with his dad and two brothers after the death of Ali's mother and the decline in his father's business. Everyone is handling their grief in different ways and I really liked seeing Ali's brother, Umar, struggle with Ali and their dad's return to Islam and we can see that, for Umar at least, it isn't quite that easy and that there's still plenty of anger and helplessness in the face of loss. And then there is Amirah, who is pretty resistant to the idea of boys and marriage especially in light of her mother's disastrous love life as her mother is, at the beginning of the novel, grappling with her fourth divorce. And at the same time Amirah is also questioning what she wants to do with her life and what she sees for her future. She loves art but other more practical subjects are more encouraged and pushed. It was great to see people using their religious beliefs to do good things, like setting up a youth group and raising money for charity. It was great to explore the Muslim faith more. I found it really interesting to see the pressures that both Ali and Amirah were under - from themselves, their families, their friends, their community and within their religion. It was a very interesting experience. Definitely sounds like an interesting read. It was. Very different perspective. Sounds really great! I'll have to look out for it in the shops.